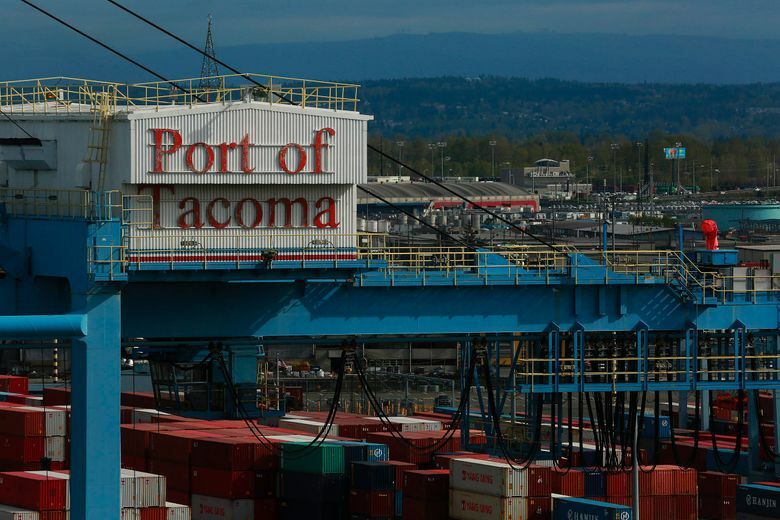 Peace has broken out between the ports of Tacoma and Seattle, and their commissioners are expected to vote one last time Tuesday to finalize their plan to stay competitive by joining forces. The Northwest Seaport Alliance, which is intended to consolidate the marine-cargo divisions of the two historically rival ports, was announced in October after months of secret meetings — and about 30 years after the idea was first floated. The Federal Maritime Commission gave its approval to the arrangement July 21, and after Tuesday’s vote, the two ports will begin combining their cargo operations into what they call the Puget Sound Gateway — the third-largest container gateway in North America. Here’s an explanation of what drove this long-debated move and how the alliance seeks to preserve the region’s marine-cargo business. Why do the two ports need to work together? The combined Seattle and Tacoma share of the West Coast’s container traffic has dwindled to almost half what it was two decades ago. 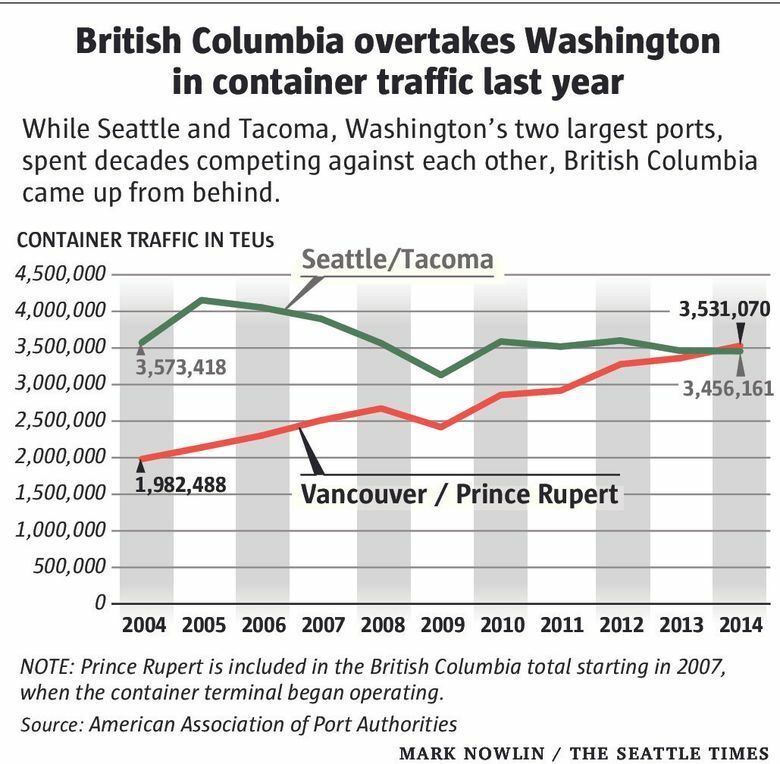 Meanwhile, British Columbia’s market share has almost tripled; its container traffic overtook Seattle and Tacoma in 2014. In recent years many major ocean carriers have formed consortiums to save money by poolingtheir cargoon larger ships and calling on fewer ports. This leaves ports worldwide scrambling to accommodate these ever larger ships. Seattle and Tacoma can fit ships that can carry up to 10,000 TEUs, or 20-foot equivalent units. Meanwhile, megaships exist that can carry more than 18,000 TEUs. Put on end, such ships are twice the height of the Space Needle. The local ports each have one terminal that could potentially accommodate an 18,000-TEU ship, according to a study by Mercator International. But to be competitive, the report says, the ports need to be able to accommodate two megaships in one facility by 2020. By pooling assets and operating cargo divisions together, the alliance aims to to prevent redundant investments, improve efficiency and stabilize rates. Why wasn’t this done before? The idea of some sort of merger has been floated more than once in the past 30 years but never clicked until 2014, said Steve Sewell, current maritime-industry sector lead for Gov. Jay Inslee and former Seattle seaport director from 1994 to 2002. 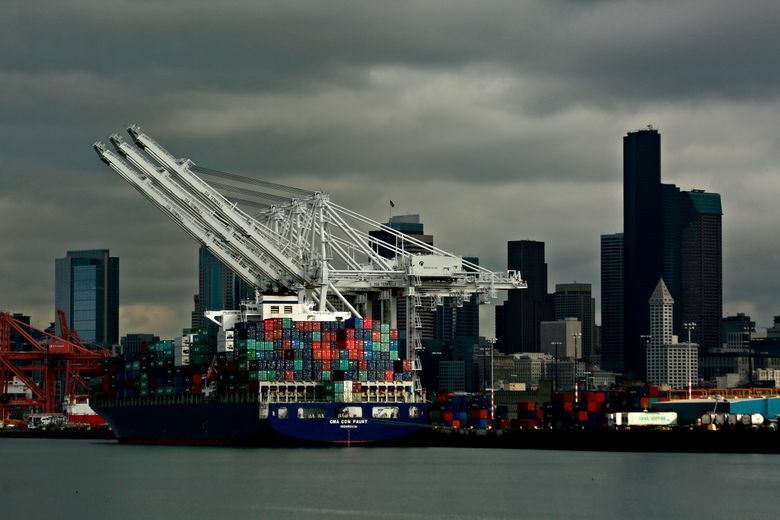 Now, the 10 commissioners overseeing the two ports understand the “brutal market conditions,” said Port of Seattle Commissioner John Creighton. Together the ports are only using 45 percent of their capacity. That enables the ocean carriers to play the ports off each other to get better rates. Less revenue leaves terminal operators and the ports with little or no capital available to reinvest in the terminals. Wouldn’t shipping firms prefer the old way? While ocean carriers do want to keep costs down, they also need reliability, certainty and choices, said Capt. Michael Moore, vice president of the Pacific Merchant Shipping Association, which represents ocean carriers and West Coast terminal operators. Moore said his members “understand that a more competitive gateway in the long term benefits all involved,” and they want ports that can adapt to the ever-bigger cargo ships. Will there be a winner and a loser? Forming the alliance forces the two ports to take a critical look at their assets and consider upgrading or repurposing their container terminals. To become more competitive, the ports expect to shrink theirinternational container terminals from a combined 1,080 acres to 850 acres. Yet they project growing their container traffic from 3.4 million TEUs last year to 6 million by 2025, according to the ports’ strategic business plan. It calls for each port to have a “strategic terminal” that can accommodate two of the megaships coming online. It suggests Terminal 5 in Seattle and the General Central Peninsula in Tacoma, which includes Husky Terminal and the Olympic Container Terminal. Optimizing the international container terminals would leave roughly 230 acres to diversify the marine-cargo offerings, which could include logs, domestic cargo, noncontainerized or “break-bulk” cargo, and autos. Is Seattle getting out of the seaport business? While some terminals may be repurposed, Creighton insists that does not mean turning them into condos, but rather into something else in the maritime industrial sector. SeattleCommissioner Bill Bryant said all investments at the two ports will be coordinated. He added that if Seattle were to get out of the container business, Tacoma would not be able to handle all the cargo and the rail traffic that comes with it, putting Washington at risk of losing more market share. Dean McGrath, International Longshore and Warehouse Union Local 23 president in Tacoma, is skeptical. He said the biggest concern for the unions is this idea of repurposing. “We have to make sure they don’t make a shortsighted decision,” McGrath said. He said he doesn’t want to see the ports make a terminal into something, like condos, that doesn’t allow for expansion in the future. He and other union leaders are part of an executive advisory council the ports created to hear from stakeholders on ways to improve the gateway operations. “The more input from people who really have some skin in the game will make this more successful,” McGrath said. Why all the talk about container traffic? Container traffic generates the majority of the combined seaports’ revenue. A declining market share has a big impact on the bottom line. The Seaport Alliance, however, covers all marine cargo. If the two ports had only aligned their container businesses, it would have left the door open to competition for other marine cargo if some container terminals are repurposed, said Creighton. The idea is for an even split between what goes into the alliance so each port receives 50 percent of the revenues and profits. The valuation was a stumbling block for the commissioners, though. Currently, the valuation of the assets put into the alliance is $316.3 million for Tacoma and $329.6 million for Seattle, which makes the split 51 percent for Seattle and 49 percent for Tacoma. A breakout of asset valuations has not been released. Port of Seattle Deputy Chief Executive Officer Kurt Beckett, who will be the alliance’s deputy CEO of operations, has said the intent is still a 50/50 split. He said the numbers will not be locked in until the end of the year, and will be revisited in 2017. Included are all container terminals and associated industrial properties, as well as log, auto and break-bulk facilities. Kept out of the alliance are both ports’ grain terminals, Seattle’s aviation division, marinas, Fishermen’s Terminal and cruise terminals, as well as some real estate that does not support the maritime cargo. In Tacoma, the assets outside the alliance are industrial real-estate facilities, including the proposed locations of Northwest Innovation Works, a facility to convert natural gas to methanol, and Puget Sound Energy’s planned Liquefied Natural Gas facility site. What are other West Coast ports doing? Southern California and British Columbia are investing hundreds of millions of dollars to upgrade terminals and surrounding infrastructure to get big-ship ready. Prince Rupert, for example, has plans to spend $158 million to increase container capacity to 1.3 million TEUs a year to enhance the Canadian gateway’s growing role in North American trans-Pacific trade. The Port of Long Beach, Calif., has $3 billion worth of bridge-replacement, terminal-modernization and rail projects on the books for the next decade. 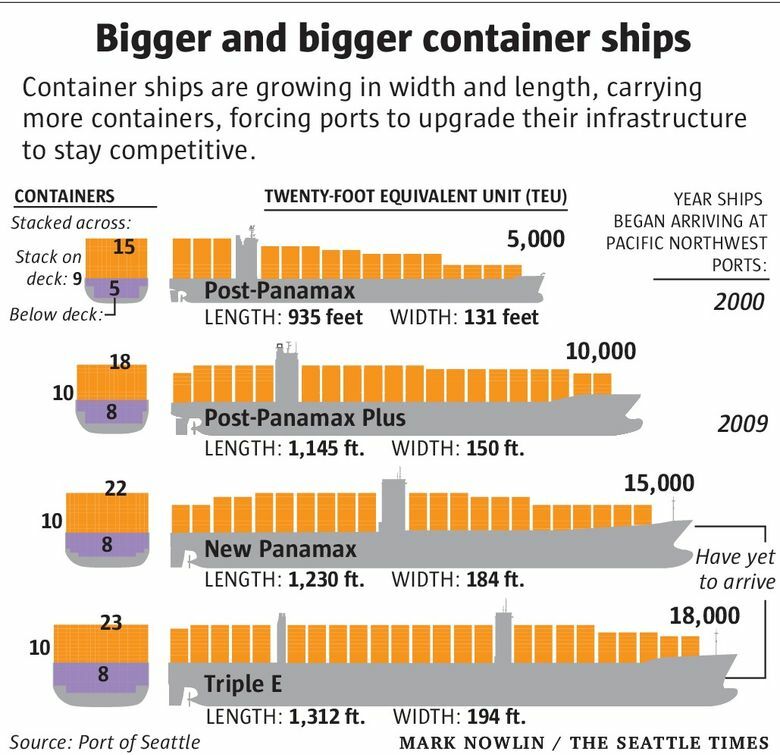 While Seattle and Tacoma have naturally deep waterways that can accommodate megaships with little or no dredging, they will not be able to handle multiple ships of that size without upgraded terminals and surrounding infrastructure. Dan Thomas, chief financial officer for the Port of Seattle, said King County’s property-tax levy is not being used for seaport investments. In 2009, the commissioners voted to stop using levy funds for seaport purposes because container revenue was strong. The tax levy is mainly used to support the Fishermen’s Terminal, which is not self-sustaining, and for environmental remediation and paying back bond debt. The Port also agreed to fund up to $300 million for the Highway 99 tunnel project with levy funds. “But that still remains to be seen,” he said. In terms of governance, the Seaport Alliance will be similar to Pike Place Market and the Seattle Art Museum, which are public-development authorities. Gov. Jay Inslee signed a bill giving the ports that ability in April. The tax-exempt port-development authority will make the alliance a separate entity from the ports for contracting, auditing and reporting purposes. It will be governed by the 10 members of the two port commissions. Port of Tacoma CEO John Wolfe will serve as the CEO of the Seaport Alliance and remain in his current position. By the end of five years, the Port of Tacoma is expected to make the port CEO a separate position.